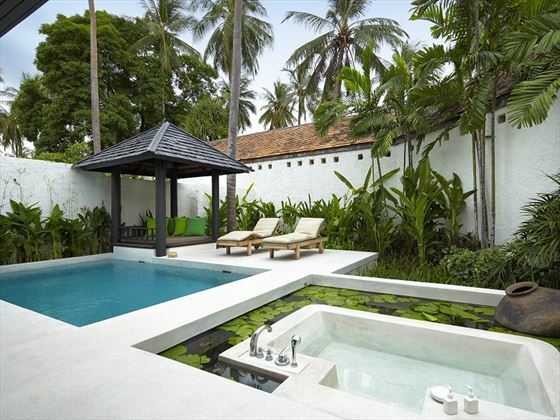 It was the coastal retreat for royalty long before Phuket or other Thai islands became popular. 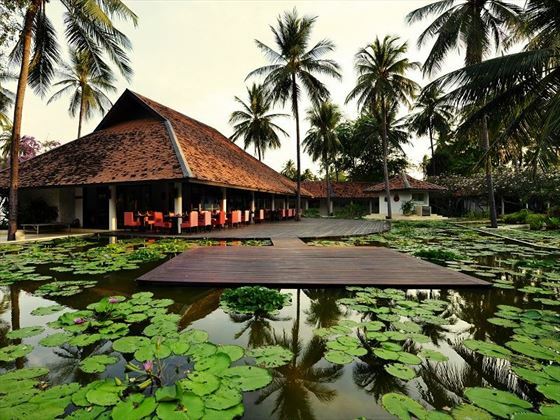 Located three hours-drive southwest of Bangkok, it’s a far cry from the hustle and bustle of the capital city and offers a tropical beach experience without onward flights. It’s a perfect combination with a few days in Bangkok, and apart from the beach itself, the strongest attraction here is the renowned Six Senses spa, with a full range of therapeutic and holistic treatments. 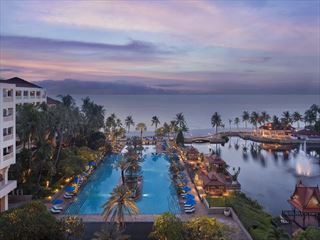 Set among 20 acres of landscaped tropical gardens filled with lotus ponds and waterways overlooking the Gulf of Siam. Guestrooms are spread out within five low-rise buildings and the resort rooms have undergone an extensive renovation in 2016. Evason Hua Hin is located at Pranburi 30 minutes to the south of Hua Hin town and 230 kilometres from Bangkok (just over 3 hours’ drive); guests fly directly into Bangkok from the UK, where you will be met and transferred by car. 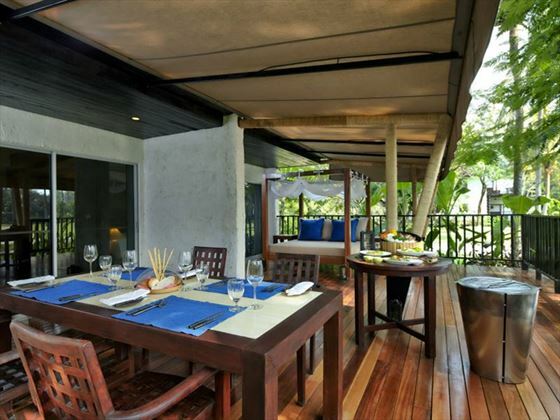 Pranburi itself is a family friendly resort area with a promenade with local restaurants and massage shacks. There is a new cycle path and guests can take bicycles to explore the small beaches and local restaurants dotted along the coastline. 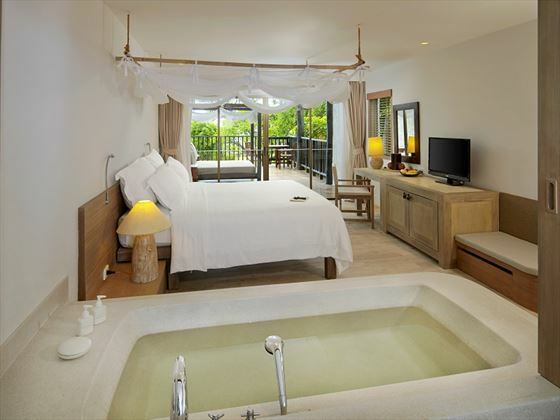 Evason Rooms – spacious with indoor bathroom and balcony, twin or king beds available with an additional large day beds can be made up as an extra bed at night for 1 child. 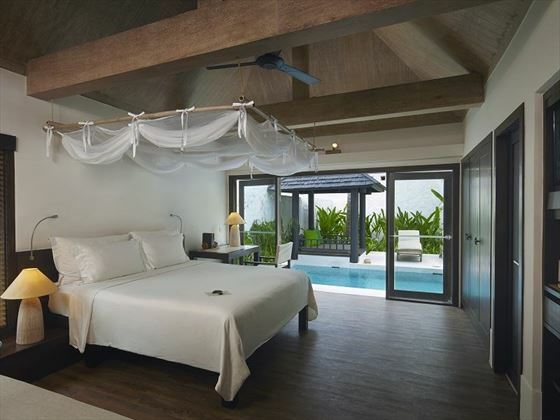 New One and Two Bedroom Evason suites - they feature fabulously spacious outdoor terraces with an entertainment system in the living room, daybeds and dining tables. One bedroom units accommodate 3 people and two bedroom can sleep a family or group of up to 5. 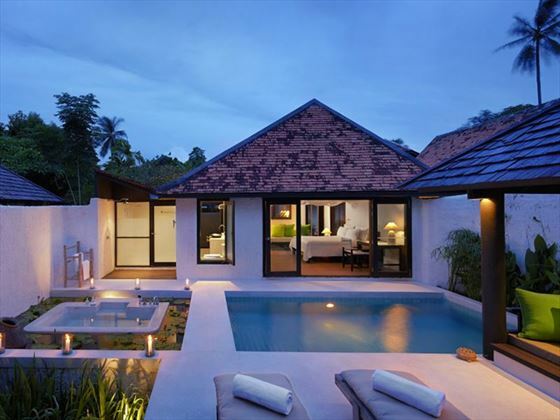 Pool Villas are a luxury home from home for up to 2 adults and 2 children - self-contained within a walled garden with a private plunge pool, large outdoor bathtub, and outdoor lounge with sun loungers. There is one bedroom with extra bunk beds for the children. Families staying a minimum of 3 nights with up to children 0-11 years, sharing with 2 adults will enjoy complimentary access to ‘Just Kids’ (4 years minimum for the pool and playground use). The kids can then join in the fabulous activities programme. An additional list of chargeable activities are offered at the club so that kids can try their hand at things like Muay Thai boxing. Babysitting services are also on offer. Complimentary lunch and dinner from the Kids Menu in all outlets when dining with two full paying parents and fresh juices at Just Kids throughout the day. Parents looking for an indulgent spa treat can book a three hour treatment and enjoy 3 consecutive hours babysitting (minimum age at 4 years) at “Just Kids”. 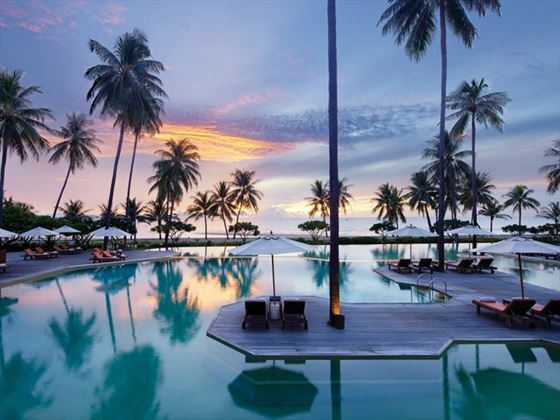 The infinity pool looks out over the ocean and when you fancy a change of view and want to relax on a sandy beach, the hotel offers a complimentary shuttle to Khao Khalok beach. 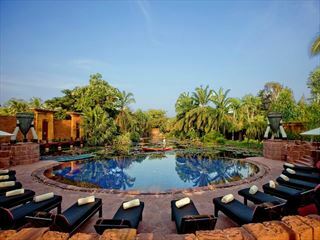 Six Senses Spa with five outdoor treatment salas surrounded by lotus ponds. Inside the spa there are two treatment rooms for couples. Available throughout the year (except for the festive period) for a minimum stay of 5 nights. Lunch and Dinner daily with drinks – 3 courses from a la carte menu at The Bar, Kieng Sah and Coast restaurant or Buffet when available. Drinks in The Bar – 12noon – 12 midnight (Local Beer, House wine by the glass, House spirits, Tea, coffee, drinking water and juices. Complimentary bicycle hire per person throughout the day. Complimentary Archery - 1 hour per person per day. 30 minute Head & Shoulder or Foot Massage in the Six Senses Spa per person per stay.